Photovoltaic performances of CsPbI2Br solar cells are still lower than those of hybrid inorganic–organic perovskite solar cells, and researchers are exploring ways to improve their efficiencies. Due to its higher thermal stability in comparison with the generally studied hybrid inorganic–organic perovskites, all-inorganic CsPbI2Br has recently attracted great attention. By utilizing the combination of MnCl2 and ZnCl2 particles doping to modulate film growth, it is found that MnCl2 and ZnCl2 particles infiltrate into the holes of the CsPbI2Br lattice through the growth procedure, leading to suppressed nucleation and reduced growth rate. The combination assists to achieve higher CsPbI2Br crystalline grains for increased Jsc as high as 15.66 mA cm−2 and FF as large as 73.37%. It is indicated that a specific combination of ZnCl2-MnCl2 doping can fundamentally improve the film surface morphology, reduce trap density, and suppress the recombination of carriers. Consequently, power conversion efficiency (PCE) is significantly improved from 13.47 to 14.15% compared with the reference device without doping. Hybrid organic–inorganic perovskites have aroused great concerns because of their excellent electronic and optical properties [1, 2, 3, 4, 5, 6, 7] such as high mobility of the charge carriers and tunable band gap [8, 9, 10, 11]. Notably, the power conversion efficiency (PCE) of perovskite-based organic–inorganic hybrid solar cells has improved from 3.8 to 23.3% through the cation exchange [12, 13, 14, 15, 16, 17]. There are still challenges to overcome all environmental degradation . Up to now, the cesium lead halide perovskite solar cells have been researched by many groups [19, 20, 21, 22]. The large band gap of CsPbBr3 is about 2.3 eV, which is too large to absorb long-wavelength lights [23, 24]. The CsPbI3 has a low band gap of 1.73 eV, but it degrades rapidly from black phase to yellow phase at ambient temperature [25, 26]. 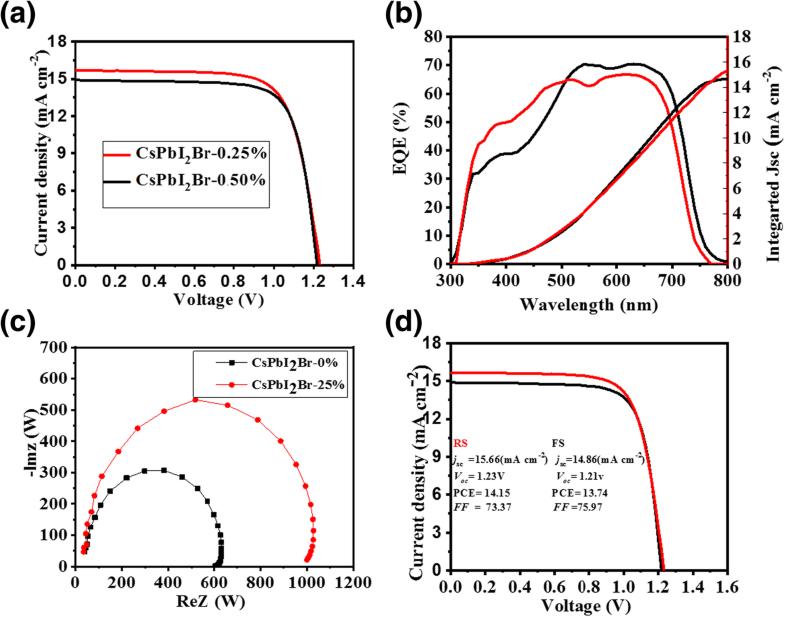 CsPbI2Br perovskite shows a desirable band gap of 1.91 eV and is stable in the black phase in ambient air [19, 20]. It is demonstrated that the size of microcrystalline grain is a key factor for increasing the efficiency of solar cell. [27, 28, 29, 30]. It appears that the grain boundaries in the surface of perovskite film suppress the recombination of the charges in their trap states . Meanwhile, grain boundaries can provoke external states near the edge of the valence band which will impede the spread of the hole . Therefore, it is desirable that the CsPbI2Br has a huge particle size and a low trap charge density . For this purpose, the doping of impurities was explored extensively by incorporating several ions into the host lattice to modulate the performance of the film . For example, by incorporating potassium into CsPbI2Br, these large CsPbI2Br crystallites could be obtained to improve the formation of charge carriers and the better charge transport increases PCE . Chu et al. used KCl as an additive material to obtain uniform and dense MAPbI3 perovskite films with large grain-size nanocrystals . Liu et al. reported that the addition of Mn2+ with a certain amount could significantly improve the crystalline grain size and achieve superior solar cell performance . All-inorganic CsPbI2Br has recently attracted great attention due to its higher thermal stability in comparison with the generally studied hybrid inorganic–organic perovskites. In the paper, it is indicated that a specific combination of ZnCl2-MnCl2 doping can fundamentally improve the film surface morphology, reduce trap density, and suppress the recombination of carriers. Consequently, PCE is significantly improved from 13.47 to 14.15% compared with the reference device without doping. To the best of our knowledge, the PCE of 14.15% is among the best performance of CsPbI2Br perovskite solar cells. We prepared 1.0 M using solution CsBr together with equal stoichiometric PbI2 in mixed solvents of DMF and DMSO as the precursor solution. Through a one-step spin-coating method, a 350-nm film (measured by profilometer) was obtained after being annealed at 150 °C. To study the effect of additive on the film morphology and the device performance, we incorporated different contents of ZnCl2-MnCl2 (0%, 0.25%, and 0.50%) molar ratio, marked by CsPbI2Br-0%, CsPbI2Br-0.25%, and CsPbI2Br-0.50%, respectively, into the CsPbI2Br precursor solution. Figure 1a–c shows the top-view of CsPbI2Br films with different levels of ZnCl2-MnCl2. It can be seen that when the combination of ZnCl2-MnCl2 content is less than 0.25%, the CsPbI2Br film becomes more uniform and compact with the increase of the ZnCl2-MnCl2 content. In addition, there are almost no pin holes in the CsPbI2Br-0.25% film, suggesting that the combination of ZnCl2-MnCl2 dopants is in favor of surface morphology of films. In the CsPbI2Br-0.50%, however, small pin holes emerge in the film, which can create derivation paths and result in worse device performance. Figure 2a shows the XRD patterns of the CsPbI2Br films doped using different ZnCl2-MnCl2 concentrations. The thicknesses of all the CsPbI2Br films are controlled to be 350 nm. Figure 2b shows the enlarged region of the (100) peak. It can be seen that the peak of the CsPbI2Br-0.25% film shifts to a higher angle, indicating that the lattice constant is decreased. XPS analysis was performed to study the elemental composition and chemical state of the elements in the CsPbI2Br-ZnCl2-MnCl2 films. Figure 2c–f shows the XPS spectra of all components with the exception of ZnCl2 and MnCl2. As appeared in Fig. 2c, the Cs 3d range determines two peaks at 724.4 eV and 739.8 eV, which are apportioned to Cs 3d 3/2 and Cs 3d 5/2 of Cs+ cations, respectively. 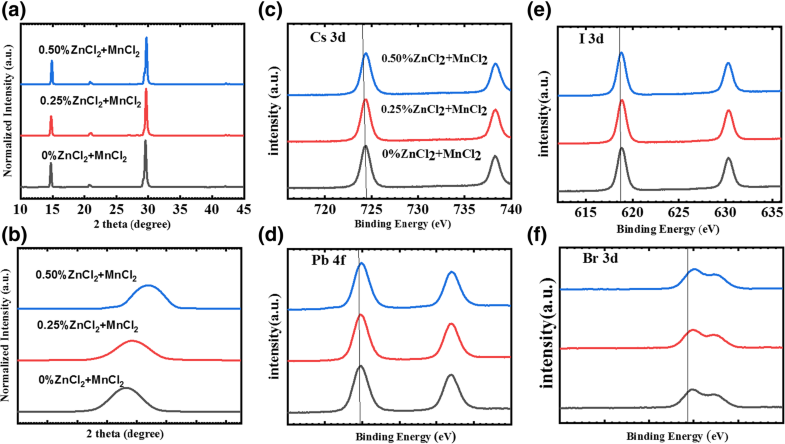 Figure 2d–f demonstrates that Pb 4f, I 3d, and Br 3d peaks shift to higher binding energy, which indicates that some Zn and Mn particles may replace certain Pb atoms located in B-sites of the perovskite, and therefore, the chemical bonding between halides and lead have been changed due to the ZnCl2-MnCl2 doping . This is consistent with the above XRD analysis. The lightweight J–V curves of the cells based on the CsPbI2Br-ZnCl2-MnCl2 films are shown in Fig. 3a, and the relevant photovoltaic parameters are recorded in Table 1. The CsPbI2Br-0.25% device shows a champion PCE of 14.15%, with Jsc of 15.66 mA cm−2, Voc of 1.23 eV, and FF of 73.37%, which are totally higher than those of the CsPbI2Br-0% device. We attribute this progress to enhanced film quality and reduced defects resulted from the ZnCl2-MnCl2 doping. External quantum efficiency (EQE) is done to verify the accuracy of Jsc completed from the J–V curve. As appeared in Fig. 3b, the EQE and interconnected Jsc of CsPbI2Br-0.25% device are greater than those of the CsPbI2Br-0% device. The interconnected Jsc of the CsPbI2Br-0.25% device is 15.66 mA cm−2, which is close to the Jsc of 14.86 mA cm−2 from the J–V bend. To research charge exchange properties of perovskite solar cells (PSCs), electrochemical impedance spectroscopy EIS spectra was completely abstracted as a function of voltage. The recombination resistance (Rrec) was extracted from the diameter of the semicircle in the Nyquist plots. Figure 3c shows that the Rrec of the CsPbI2Br-0% and CsPbI2Br-0.25% devices are 620 Ω and 1016 Ω, respectively. The much larger Rrec for the CsPbI2Br-0.25% device originates from lower defect density, which indicates that charge recombination is effectively suppressed, leading to significantly improved Voc and FF . Figure 3d presents the typical J–V curves of the device with the best measured performance. Using the scanning directions of forward and reverse, the key parameters are summarized in the insert. It is noticeable that the device has very little hysteresis, as shown by the J–V curves. Finally, we studied the long-term stability of the perovskite solar cells PSCs based on the CsPbI2Br-0.25% film. The device was stored in a N2 glove box (20 °C in the dark). Figure 4a shows the normalized Jsc, Voc, FF, and PCE as a function of the storage time. During the first 3 days, Jsc, FF, and PCE all increase. This might be attributed to oxidation of spiro-OMeTAD by trace O2 (300–400 ppm) in the glove box. After 30 days, the PCE maintains 87% of its initial value and Voc keeps almost constant. We expect that these results will help the development of cesium lead halide perovskites for next-generation photovoltaic. The histogram of 30 devices’ power conversion efficiency is shown in Fig. 4b, with statistics for photovoltaic parameters. Figure 4c shows the thermal stability of CsPbI2Br-0.25% device tested by heating the device at 80 °C for 150 min in the glove box, and after heating, the PCE of device maintains 96% of its initial value and Voc keeps almost constant. The absorption spectra of ultraviolet–visible (UV–vis) were carried out to observe the photo physical characteristics for the CsPbI2Br-ZnCl2-MnCl2 films fabricated on glass substrate with a thickness of 70 nm. Figure 4d shows the absorption spectra of the CsPbI2Br-0.25% film. The absorption intensity is almost the same for all the CsPbI2Br-ZnCl2-MnCl2 films, and the absorption onset is around 600 nm. 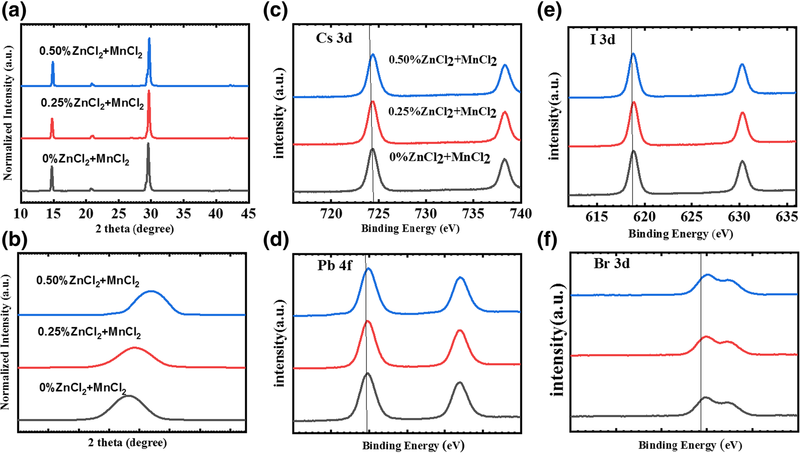 The above result suggests that the slight ZnCl2-MnCl2 doping hardly affects the band gap and the light absorption capacity of perovskite. The SnO2 were bought from Alfa Aesar. CsBr, ZnCl2, MnCl2, (DMSO), and (DMF) were bought from Sigma-Aldrich. spiro-OMeTAD and PbI2 were bought from Xi’an Polymer Light Technology Corp. Initially, the ITO glasses were successively cleaned by applying detergent, isopropyl alcohol, acetone solvents about 20 min, and deionized water. The process is also followed by removing the substances remain in the substrates through oxygen plasma processing approximately for 10 min. The SnO2 were diluted in ultrapure water at a volume ratio of 1:6. Firstly, glass substrates were spin coated by SnO2 layer at 3000 rpm for 40 s, and then were annealed at 150 °C for 30 min. To prepare a perovskite precursor, CsBr, PbI2, ZnCl2, and MnCl2 were stoichiometrically dissolved in a mixed solvent of DMSO and DMF with a volume ratio of 1.4:1 to form a 1.0 M solution. The solution was filtered through a 0.22-μm pore PTFE filter, and then stirred at 70 °C for 2 h. The precursor solution was then spin coated on the SnO2/ITO substrate firstly at 1000 rpm with accelerating rate of 1000 rpm for 12 s, after that at 5000 rpm with accelerating rate of 3000 rpm not more than 30 s. Then, 100 μL of chlorobenzene (CB) were distilled onto the rotating substrate during the second step spin-coating with the time of 10 s before the end of the process. Afterwards, the film was first annealed at 50 °C for 1 min and then at 150 °C for 5 min. An HTL film was prepared by spin-coating spiro-OMeTAD solution onto the formed CsPbI2Br film at 4000 rpm with accelerating rate of 3000 rpm for 30 s. The spiro-OMeTAD solution consisted of 72.3 mg Spiro-OMeTAD, 17.5 μL bis (trifluoro methane) sulfonamide lithium salt (Li-TFSI) stock solution (520 mg Li-TFSI in 1 mL acetonitrile), 28.8 μL 4-tertbutylpyridine, and 1 mL chlorobenzene. At the end, the Au film with a thickness of 80 nm was deposited through thermal evaporation. The Rigaku-2500 X-ray diffraction meter was used to measure the X-ray diffraction patterns. The top-view SEM images were attained using a scanning electron microscope (SEM, HITACH2100). Keithley 2420 was used to measure the solar cell J–V characteristics under AM 1.5 sunlight at an irradiance of 100 mW cm−2 provided by a solar simulator (Newport, Oriel Sol3A Class AAA, 94043A). The intensity of light was measured by monocrystalline silicon reference cell with a KG5 window (Newport, Oriel 91150). Impedance spectroscopy was measured by Zennium (Zahner). EQE was recorded using a Newport Oriel IQE-200 by a power source (Newport 300 W xenon lamp, 66920) with a monochromatic instrument (Newport Cornerstone 260). The device area is 0.044 cm2. 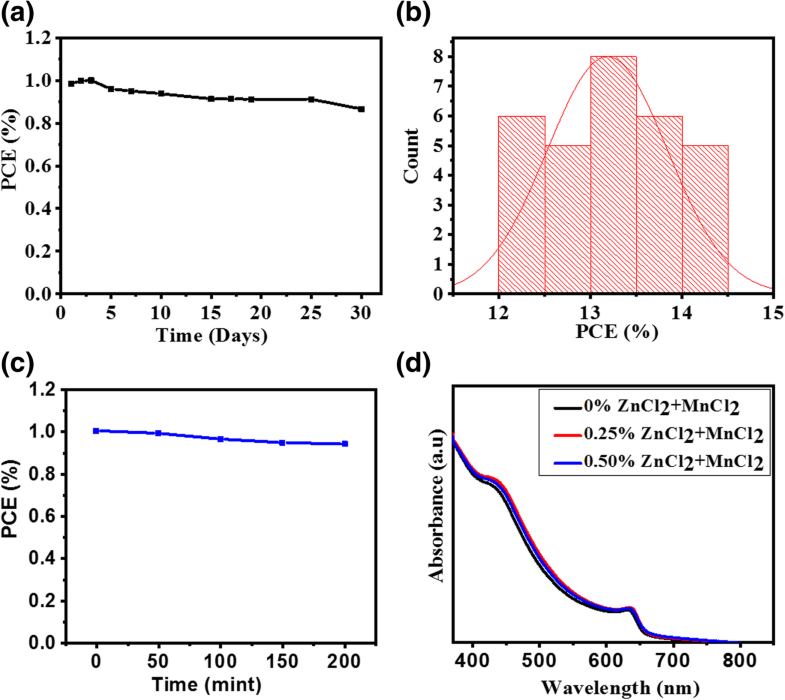 In summary, we got inorganic CsPbI2Br solar cells by incorporating ZnCl2-MnCl2 into the CsPbI2Br precursor solution. When the ZnCl2-MnCl2 content achieves 0.25%, the device shows a champion PCE of 14.15%, with FF of 73.37%, Jsc of 15.66 mA cm−2, and Voc of 1.23 eV. The enhanced photovoltaic performance is associated to improved surface morphology, reduced trap density, and suppressed charge recombination. This work could guide fundamental researches in the Cesium lead halide perovskites and promote their potential applications for solar cell. A simple compositional engineering technique is used to improve the film quality and device performance. 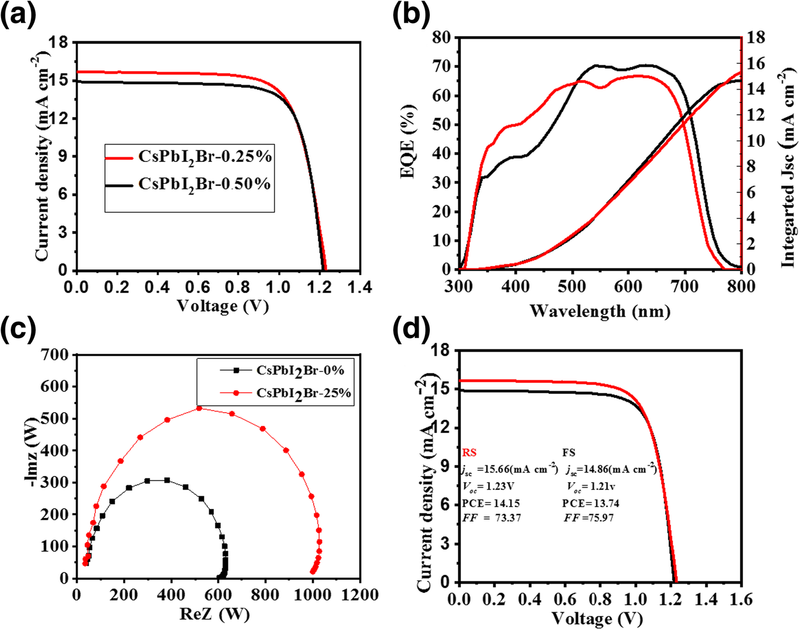 By incorporating MnCl2+ZnCl2 into the CsPbI2Br film, the CsPbI2Br perovskite solar cell attains an outstanding efficiency of 14.15% and good long-term stability. In addition, the fabrication process is highly reproducible and inexpensive. This research work were supported by the (NSFC) National Natural Science Foundation of China (Grant numbers No. 61675024, and No. 61874009). The results of this article are incorporated within the article datasets. UK fabricated the devices and performed the experiments. UK and AAK analyzed the data. 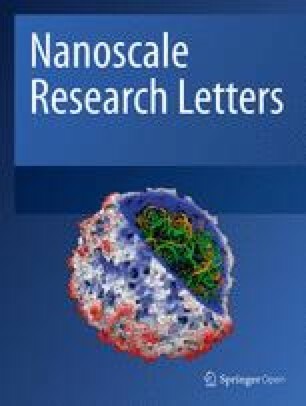 YZ, AZ, and NU revised the manuscript. Finally, all authors approved the final manuscript to be submitted.